2010 was the year of my cooking resurgence. I’ve always cooked, but I never took the time and energy like I did this year to truly enjoy the experience of cooking. I also didn’t open myself up to trying new things as much as I have in the past year. In 2010 I decided, I wanted to cook more, try more, do new things and one of my favorite vegetables to work with has been butternut squash. I’ve fallen in love with the beautiful orange color and the savory yet slightly sweet taste when it’s cooked. Roasted chicken and butternut squash soup has become a weekend staple in my house and this evening I made a roasted red onion and butternut squash pasta that is out of this world. Whenever I fall in love with something this hard I regret all the years I couldn’t been enjoying it. Kind of like when I finally bought leopard print heels and couldn’t figure out why these hadn’t been a wardrobe staple for years. Sigh…I guess you live and learn, huh? 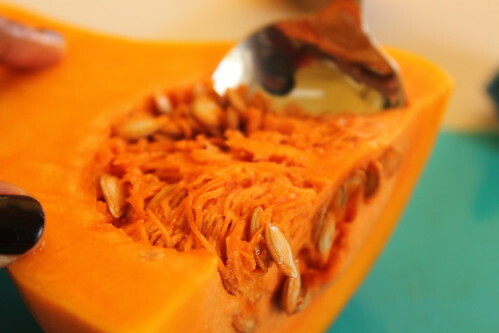 Butternut squash, I’m sorry I waited so long to fall in love with you but I promise you, my love will never stray.